Getting HDMI to work properly on a hackintosh whether it be displaying 4k@60hz or actually getting HDMI to display anything at all other than a black screen can be tricky especially for those that don’t know HDMI has problems working on a hackintosh especially at 4k or high refresh rates. To get around this limitation what you can do is use a HDMI to DP active adapter which I personally used to get 4k 60hz working on an HDMI only display through a GPU that wouldn’t display 4k60 over it’s HDMI output. The easiest way to get your monitor or TV to display at it’s right resolution on a hackintosh is with Display Port, but since almost all 4k TVs only come with HDMI inputs and no DP input support you’re only option is to use an adapter adapter. What you do is plug the Display Port end into the graphics card/motherboard and the HDMI end plugged into the display. The adapter has to be an active adapter and the display needs to support HDMI 2.0 in order for this to work up to 4k60 and lastly you will of course need an HDMI High Bandwidth Cable like the Cable Matters Cerified HDMI Cable which is what i’m using for my hackintosh. For my adapter of choice I purchaed the Plugable Active DisplayPort to HDMI 2.0 Adapter which I chose over the Club 3D Adapter, another hackintosh compatible HDMI to DP adapter, because the reviews of the Plugable adapter were much better, the fact that it was newer and from what I can tell based off it’s reviews it seems to have better compatibility with more TV’s compared to other dapter. I’ve tested and used the Plugable Adapter on both a Sony and LG 4k TV both of which I was able to achieve 4k60hz. Tip: If you have an Nvidia graphics card try disabling Compatibility Support Module (CSM) in BIOS before getting an active adapter as that may be what’s preventing you from getting HDMI working. 3 Comments on "Best Hackintosh 4k HDMI to Display Port (DP) adapter"
(link has hackintosher’s affiliate tag added). 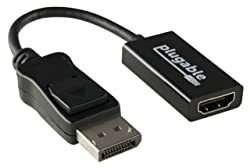 I just purchased one of these adapters for my 4k monitor and I am glad to say it works at full 60hz without having to use SwitchResX to force the resolution. With the Club3D adapter I couldn’t get 60hz without SwitchResX running. I am very pleased with the results and I am glad to have full native 4K over HDMI 2.0 with this adapter and I would recommend it to anyone using a 4K screen!